The John and Mary Pappajohn Clinical Cancer Center in Holden Comprehensive Cancer Center exists for the treatment of patients with both solid tumors and hematologic malignancies. The Pappajohn Clinical Cancer Center provides dedicated clinic and inpatient space. It is staffed by an interdisciplinary team composed of specialists from areas including surgery, internal medicine, and radiation oncology. Endocrine surgery is involved with the evaluation and treatment of patients with diseases of the thyroid, parathyroid, adrenal glands and endocrine pancreas. We perform minimally invasive parathyroidectomies with intraoperative PTH assays, and laparoscopic adrenalectomies. 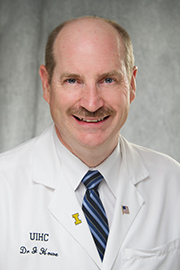 The University of Iowa Hospitals and Clinics Breast Cancer Care program is composed of a team of highly-trained physicians of different disciplines combined into one center to provide patients with the best cancer care available. The care program our center offers to patients is a complete program which includes diagnosis, treatment, reconstruction and long-term follow-up. Treatments include radiation, medical treatments, surgery, or a combination of these. The Department of Surgery's Division of Surgical Oncology and Endocrine surgery has a team of surgeons that specialize in breast surgery. The Department of Surgery's Division of Plastic and Reconstructive Surgery also works closely with the Breast Cancer team when needed.